The Toms Tactical Premium Mil-Spec Trigger Group is premium quality and 100% made in the USA. Engagement surfaces on trigger and hammer are precision polished to give you a crisp trigger pull. The trigger and hammer are CNC machined from high quality 8620 steel (not MIM) and go through a 3 step heat treat process. 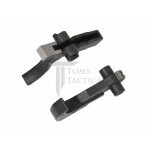 This provides superior durability and quality over most other AR15 trigger kits on the market. This kit will work with any mil-spec AR15 or lower receiver or AR-10 308. All Tom's Tactical brand products include a lifetime warranty. A high quality mil spec trigger group, and very fast shipping. Stock trigger in my Bushmaster averaged 7 lbs-14 oz. Gritty and inconsistent. Installed this trigger group from Toms and happy joy! 6 lbs-5oz, clean take up and crisp break. Quality of pull and break are as important as pull weight, maybe more so, and this trigger does it nicely at a very affordable price point. Best $40 I've spent on my rifle. Fast shipping, just top shelf service in every respect. My first purchase from this company, certainly not my last. Thank you! This trigger is the truth, fast lock, and no creep. I have purchased other more expensive triggers and this literally gives you more bang for the buck. Honestly, this started out as a budget built. 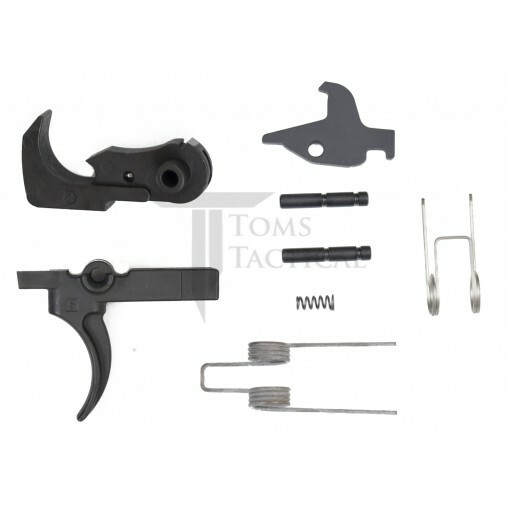 However, the quality and function with this trigger are on the same par as a premium assembly. Will be picking up more, have three already!!! This trigger with J&P enhanced reliability spring kit is great. Huge improvement over my previous gritty/stacking ALG QMS trigger. Will buy more for my other AR's.